Diversion programs connect clients to one-time financial help, instead of a prolonged subsidy, to secure housing. It is low-cost, and advocates believe it can reduce the overall homeless population, freeing up finite resources. TACOMA — All Tre’vonne Wilkins wanted was a little stability in his life. For years, he’d experienced sporadic homelessness, alternately living with friends or family, in his car or in the back of the barbershop where he worked. So when he finally walked into the office of Pierce County homeless services specialist Delmar Algee in late May, Wilkins assumed he’d leave with a voucher for housing. Instead, Wilkins and Algee talked. They talked about the thousands of dollars Wilkins owed in back rent to a former landlord. They talked about his daughter’s diagnosis at age 2 with a rare condition requiring her to get a heart transplant, which then prompted him to quit his job as a dental assistant, precipitating his later housing troubles. This kind of interaction is at the core of a unique approach to reducing homelessness called diversion. The strategy connects clients to one-time financial help, instead of a prolonged subsidy, to secure housing. It is low-cost, and advocates believe it can reduce the overall homeless population, freeing up finite resources. Diversion bears little resemblance to other homeless-assistance programs, in that it differs from person to person. People help shape the type of aid that would be most useful, from help paying first month’s rent, reunification with an estranged relative or even a bus ticket out of state, back home. Advocates of that intervention say these seemingly small fixes — “the right resources at the right time,” one advocate said — can effectively prevent someone from becoming sucked into prolonged homelessness. 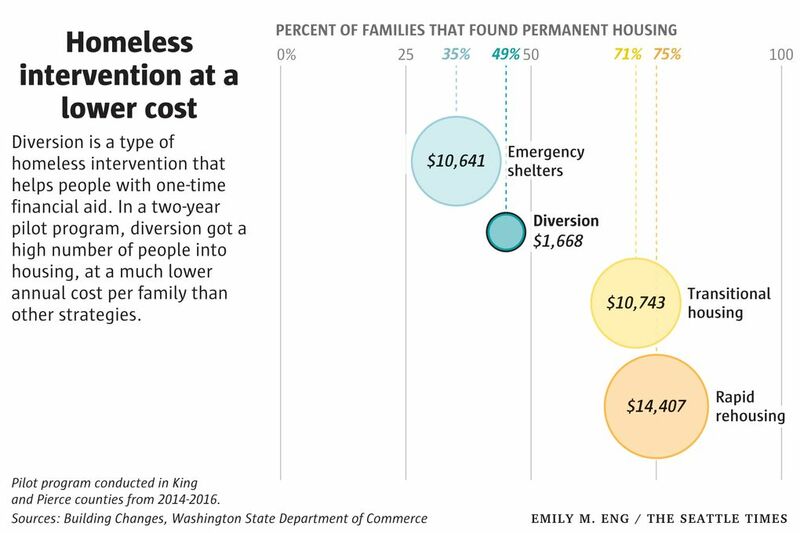 The results so far have been promising: From 2014 to 2016, almost half of the households who opted in to diversion in Pierce and King counties — roughly 930 families — found permanent housing, compared to only 35 percent of families who were living in emergency shelters. It was cheaper, too. On average, it cost $1,660 per household to find permanent housing through diversion, versus $10,700 for those in emergency shelter and $14,400 for rapid rehousing, a type of rental subsidy. This combination prompted Pierce County to go all in on diversion. Now anyone experiencing homelessness has a diversion conversation at the front door of the homeless-services system. King County and Seattle have also used diversion in the past several years, but not for every person. They now are looking to fully embrace the approach, as Pierce County has done, although it presents a greater challenge, with about 30,000 people countywide accessing homeless services every year. Diversion is borne out of necessity: Waiting lists for homeless housing are massive, and resources for homeless people are overwhelmed by the rising population of people who need help. Diversion short-circuits the traditional paths out of homelessness, and faster. The strategy can also rely on an “up by your bootstraps” mentality, which won’t necessarily work for everyone. There are people who need more intense, longer-term, and costlier, help. For Wilkins, diversion resulted in money for an apartment deposit. A few weeks after his initial discussion with Algee, Wilkins moved into that new apartment in Tacoma. It worked for Wilkins, so far. But can it work that well for everyone? Before diversion, many of the conversations Pierce County case managers had with homeless clients ended with both parties feeling hopeless, drained and uncertain. Clients had to answer a long list of personal questions to determine their “vulnerability” and their priority for housing. Then the client’s name would be submitted to a housing waiting list. “You would just sit on that roster and wait. And wait, and wait,” said Teona Kelley, a housing specialist for Associated Ministries of Tacoma Pierce County. Although Pierce County has a homeless population more than seven times smaller than King County’s, as counted during the 2018 one-night homeless count, it still doesn’t have enough housing for everyone who needs it. And, in Pierce County, clients are automatically removed from the homeless housing list after 90 days, unless they are considered chronically homeless. As recently as late July, there were 1,652 people on that list, although almost 60 percent were chronically homeless and wouldn’t be bumped from the roster. So in 2014, Pierce County — along with King County — tried an experiment, as a few other communities in the country have. Building Changes, a nonprofit that works to find effective strategies to reduce youth and family homelessness, helped the counties fund two-year diversion pilot programs. The Building Changes’ share of the money came from the Bill & Melinda Gates Foundation, a funder of The Seattle Times’ Project Homeless. In Pierce County, mediation experts were brought in to train caseworkers. Don’t tell your clients what they should do, the mediation trainers advised them. Listen to them. Help them tap into existing resources and strengths and use that conversation to brainstorm potential solutions to their housing crises. They also learned to treat their meetings with clients as an opportunity for a reality check: Many of them were never going to rise to the top of the housing waiting list. So instead, the people who opted into diversion left their appointments with an action plan. Case managers did some digging before giving clients help. If a client required one-time financial help, the money went to a third party, like a landlord, and not directly to the client. If the client said he or she wanted to live with a relative out of state, case managers phoned that relative to ensure they’d agreed to the arrangement. Pierce County officials emphasize that no one is forced to take diversion. And people who do, but end up homeless again, can go back on the housing waiting lists. About half of the people who chose diversion during the pilot were housed within 36 days, said Liza Burell, Building Changes’ program director. Most got housed without a rental subsidy. Even after the two-year pilot ended, the success has held in Pierce County. In 2016, half of the families who sought diversion were housed and remained so a year later. Last year, that grew to 54 percent. In many ways, Wilkins exemplifies the kind of person for whom diversion works particularly well. 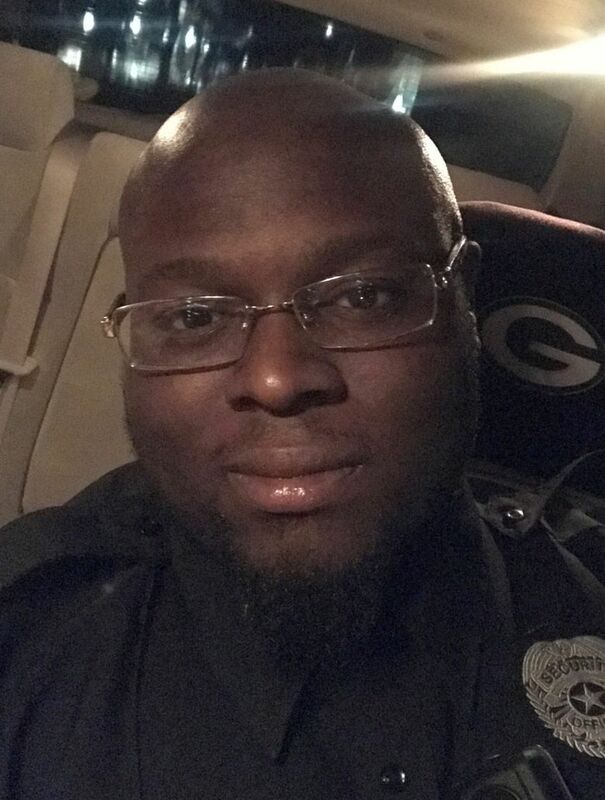 He consistently held down jobs — as a barber and a private security guard — and received occasional help from relatives. Whenever he had custody of his daughter, he made sure he had a place to stay other than his vehicle. Wilkins even had his own roof over his head, for a little while. Two years ago, he won a contest sponsored by KIRO-TV to live in a house for a year, rent-free. But at the end of that year, Wilkins had saved no money, and he was without a home again. “I blew it,” he admitted. Diversion, generally, works for people who have “lower barriers,” said Ed Boyte, who developed the diversion approach for the Cleveland Mediation Center in Ohio and was an early adopter of the strategy, starting around 2009. That can mean people who are recently employed, have income and haven’t been homeless for long. And it’s critical to keep people like Wilkins from sliding further into homelessness, before it’s too hard to get out. “The longer you’re homeless, it feels like the more opportunities you lose to reconnect quickly with your old support networks,” said Nan Roman, president and CEO of the National Alliance to End Homelessness. Just as important, for cities and counties trying to reduce their homeless populations, is keeping people from becoming homeless again. On this metric, diversion has been successful in the short-term. In Pierce County in 2016, only 17 percent of the people housed through diversion returned to homelessness and sought help from the county after one year — a return rate that blew away county officials. It’s these kinds of results that give King County and Seattle service providers hope that diversion can make a dent in the homeless population here. The city increased its diversion funding last fall, and found more than 80 percent of those helped through diversion in the first quarter of this year — 221 people — had moved into permanent housing. Still, it’s not a perfect approach. No one knows what happens to the people who don’t return for help, particularly if they moved out of county or state. “We’re creating band-aids, in some ways, with the diversion funds, without a lot of certainty of permanency,” said Janet Pope, CEO of Seattle-based Compass Housing Alliance, which has had success using diversion dollars to transport clients out of state. She worries, are we just spreading homelessness to other areas? Can we know whether the relative we’re sending them to will eventually kick them out? “Are we just stretching it out without really solving the core issues?” she said. An evaluation, released in May, found that Pierce County homeless clients were often confused about the difference between diversion and placement on the housing waiting list. Data indicated that African-American residents were far more likely to enroll in diversion than other groups were. The evaluation recommended further analysis. There have been no academic studies about diversion’s effectiveness compared to other interventions, or whether people who choose diversion are self-selecting. Building Changes is currently doing this kind of analysis, with results due by year’s end. But if diversion can thin out the list of people waiting for housing, advocates say, that positively impacts the rest of the homeless system. In Connecticut, another early adopter of the model, diversion resulted in a need for fewer shelter beds in some parts of the state, said Mary Ann Haley, deputy director of the Connecticut Coalition to End Homelessnes. This could be particularly important as King County moves in the coming months to overhaul its system for getting homeless people into housing. Currently, about 10,000 people are on the waiting list for that housing, but the county is looking to radically shrink that backlog. Diversion could be used to help the rest. Of course, diversion will have its work cut out for it: Rents are higher in King County than in Pierce. 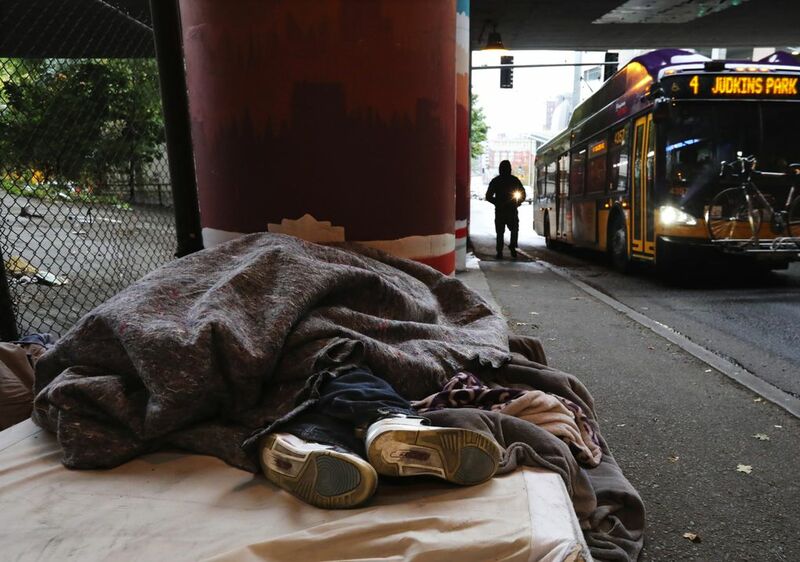 The homeless population is much bigger, and King County has a more unwieldy bureaucracy, which will make it challenging to take diversion system-wide. Tess Colby, Pierce County Human Services Community Services Division manager, remains pragmatic about diversion and how many people the intervention can actually help. A month after moving into his new apartment, Wilkins plans to quit one of his two jobs, at a barber shop, so he can work full time at a job in private security and, in turn, have more time for himself and his daughter. Sometimes, he just walks into his daughter’s room and looks around, marveling at what they have now. “It felt so good, having my own apartment, not having to duck and dodge no manager or living on someone’s couch or floor, living in my car,” he said. He had just paid the rent for August. By himself.